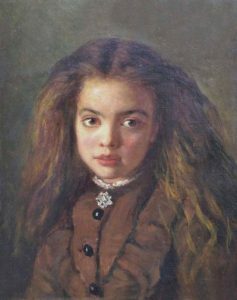 19th Century portrait of a girl by an artist in the circle of Frank Holl RA. Photo courtesy of Darnley Fine Art Gallery in London. Every great art collector will inevitably have at least one story about “the one that got away.” Whether it was a sleeper painting drafted by the hand of an old master, or simply a beloved work that went to a higher bidder at an art auction, there seems to be a tale of heartbreak in every collector’s past. For me, there are a few. As great as my passion was to acquire them, they nevertheless slipped away like an elusive unicorn, never to be seen again. To start this story of lost loves, I could begin at the beginning, but the order in which I missed out is far less important than how broken-hearted I was when I learned they could never be mine. For me, art is more than décor — it feeds my soul, inspires my work and fuels my creativity. I love a painting not simply because of its style or the artist who made it, but because it connects with me on a deeper more poetic level. Each painting is like a friend, who you know you will be friends with forever from the very first moment you meet. When I choose to add a painting to my art collection it is because I feel it belongs there, as if the artist has spent hours laboring over the canvas to create the work as a gift for me. After all, a great painting deserves more than a good home, it belongs in the place where it was destined to be. Still, as much as I admire the works in my collection, I am merely a caretaker on their journey. Knowing the art will outlive me, I set out to give each painting its voice online, to share the stories and mysteries behind them and to educate people about the artists who created them. By sharing the collection with the public, it is my hope that other people will be as intrigued and inspired by the art that has transformed my world. And though they never became a part of my collection, I learned as much in my defeat as I had in my victories. So without further ado, here are the paintings I so desperately wanted, but could not acquire. If given the choice between Leonardo da Vinci‘s Mona Lisa and this simple 19th Century portrait of a girl by an unknown Pre-Raphaelite artist in the circle of Frank Holl RA, I would have chosen the latter. In her Victorian button up coat with wild untamed hair, she was both sophisticated and unruly, exactly the painting by which the entire collection should have been led. After consulting family members (who insisted that no one else besides me could possibly be interested in buying that ugly piece), I determined I had enough time to raise the £4,000 I needed to buy her from the Darnley Fine Art Gallery in London. As I patiently waited in hopes that the price would be eventually lowered a bit, giving me time to find the remaining funds necessary to purchase it, I was devastated when I learned the painting had been sold. To this day, I still can’t put into words how much I wanted this painting or how disheartened I felt when I learned that I would never be able to own it. The gallery was kind enough to share a 4” x 6” photo of the portrait, which takes its place in a frame on my desk, reminding me that sometimes you only get one chance in life to achieve your goals. 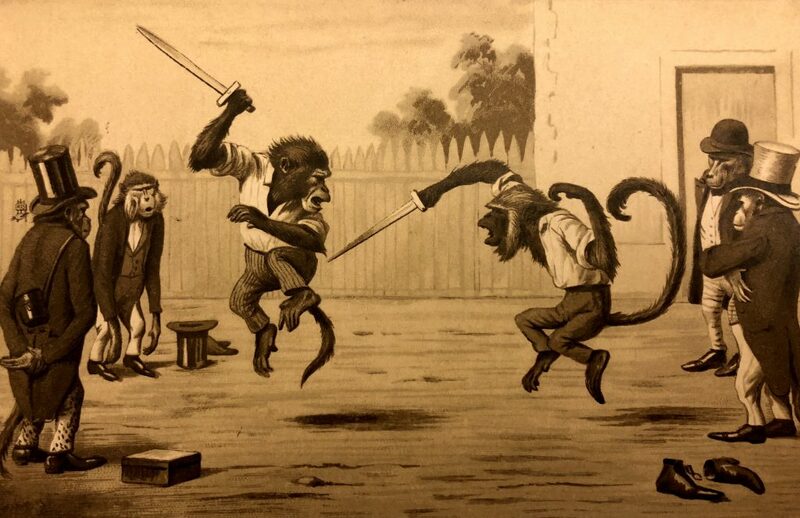 “Monkey Sword Fight” by artist Maurice Boulanger, published by Raphael Tuck & Sons in the early 1900s. One of the first paintings I missed out on when I began collecting art more seriously was a large watercolor painting in an online charity auction. The “Monkey Sword Fight,” complete with primates in formal attire was an anthropomorphic scene unlike anything I had ever seen before. The allegories and hidden meanings of the duel abounded. I immediately knew that if I could add it to my collection it would not only be a conversation piece but it would be a work that I returned to study again and again. When I later found an old postcard for sale online, I immediately recognized the scene. The postcard (series 941) was by artist Maurice Boulanger and was chromographed in Prussia by Raphael Tuck & Sons in the early 1900s. Was the painting a study for the final postcard that somehow survived the Nazi bombing in 1940 that destroyed 40,000 of the company’s works of art? Or was the piece a reproduction by a later artist? My conservative bid at the time was not enough to find out the answer and the painting was sold to a higher bidder. And then there are those works of art that I seem to miss out on, even before I have a chance to acquire them. This was the case when I learned that the enchanting portrait titled “Anna” by Polish artist Damian Lechoszest had sold shortly before I discovered it through an art gallery’s website. 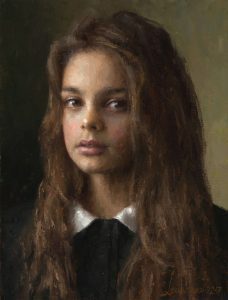 Like the portrait of the Victorian girl, Lechoszest masterfully captures the nuances of expression in his work. His extraordinary talent as an artist deserves the highest praise. The painting achieves more than simply being a portrait of a girl, it is as if the model herself is telling a story through her gaze. What all of these works have in common was the connection that I felt to them. When an artist transcends the medium to convey meaning and evoke emotion from the viewer they achieve true greatness and leave behind a lasting legacy. In the end, I may never own a painting by any of these artists. But I know that somewhere out there those paintings are being appreciated by their owners and maybe if it is meant to be, they will someday find their way to me. For more information about Damian Lechoszest’s work, including how to purchase original oil paintings by the artist, visit http://damianlechoszest.com. To view original works of art in The Michael Aaron Gallagher Collection click here.